Typical imaging presentation on FLAIR. Selected axial (A–C) and coronal (D) FLAIR images of presumed MVNT demonstrate supratentorial hyperintense intra-axial lesions consisting of groups of multiple nodules, located on the subcortical ribbon and superficial subcortical white matter following the gyral contour. The images illustrate the variability in the size and location of the lesions and the degree of surrounding signal change (A, Case 21. B, Case 23. C, Case 7. D, Case 19). A 47-year-old woman who presented with nonfocal headache (case 1). 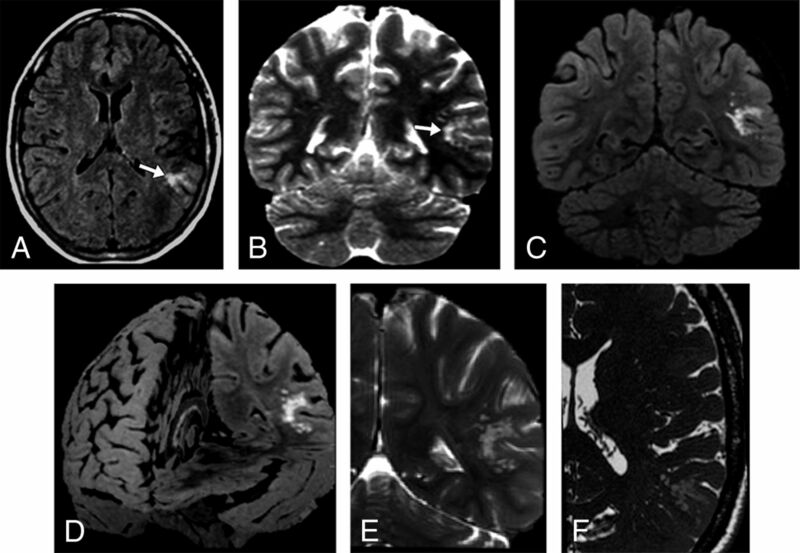 Axial FLAIR (A) and coronal T2-weighted I (B) MR images demonstrate a left temporoparietal hyperintense subcortical lesion (arrows). The lesion had ill-defined borders, and the surrounding white matter appeared slightly hyperintense on T2/FLAIR. After 60 months of clinical stability, the study was performed on a 3T scanner. Coronal FLAIR (C), FLAIR 3D reconstruction (D), selected coronal T2WI (E), and selected axial thin-section T2WI (F) show the unchanged lesion located on the inner surface of otherwise normal-appearing left temporoparietal cortex surrounding a sulcus. The groups of multiple coalescent intralesional and perilesional nodules are better depicted. 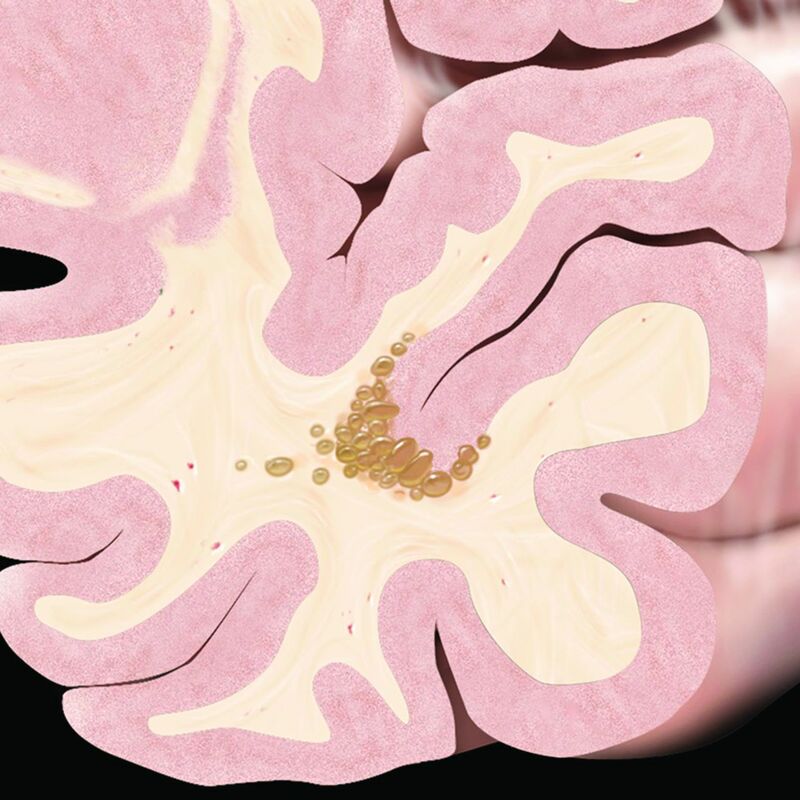 The images illustrate that the signal changes previously demonstrated in the surrounding white matter consist of innumerable very tiny nodules clustered together, sparing the overlying cortex. Most prevalent MR imaging presentations. A 50-year-old asymptomatic man with a history of skin melanoma (case 15). A–E, Selected axial MR images show a right frontal subcortical lesion consisting of groups of multiple nodules, hyperintense on FLAIR/T2WI (A and B). Selected axial thin-section T2WI (C) depicts mild hypointensity in comparison with the CSF. High signal is seen on an axial DWI (D) with high ADC values (not shown) due to the T2-shinethrough effect. No abnormal enhancement is depicted (E). No changes were detected on imaging follow-up after 25 months (not shown). A 41-year-old man who presented with nonfocal headache (case 8). F–J, Selected axial MR images reveal a left opercular subcortical lesion consisting of groups of multiple nodules, hyperintense on FLAIR/T2WI (F and G). High signal is seen on an axial DWI (H) with high ADC values (I) due to the T2-shinethrough effect. No abnormal enhancement is depicted (J). No changes were detected on imaging follow-up after 24 months (not shown). A 53-year-old male patient with temporal lobe epilepsy (case 31). A–D, MR imaging demonstrates a probable MVNT in the left parahippocampal gyrus (arrows). E, FDG-PET MR brain imaging shows focal hypometabolism in the left medial temporal lobe corresponding to the site of suspected lesion. F and G, Hematoxylin-eosin-stained histopathology slides demonstrate the abnormal clustering and vacuolation of the neuronal cells. Images were obtained with 20× magnification (F) and 200× magnification (G). A 43-year-old male patient with headaches (case 33). A, Axial FLAIR image demonstrates a left frontal lobe lesion (arrow) consisting of multiple coalescent T2 and FLAIR hyperintense nodules located in the deep cortical ribbon and without mass effect. B, Low-power photomicrograph with immunohistochemistry staining for neurofibrillary protein shows positive staining between variably sized nonstaining vacuolating nodules. MVNT typical presentation graphic illustration. Schematic coronal view depicts a nodular “bubbly-appearing” lesion located on the inner surface of otherwise normal-appearing left temporal lobe cortex within the deep cortical ribbon and superficial subcortical white matter. Reprinted from Osborn's Brain9 with permission from Elsevier.